Deja Vu. After 30 years of studied matrimonial harmony Teri decided it was time to put it all on the line. 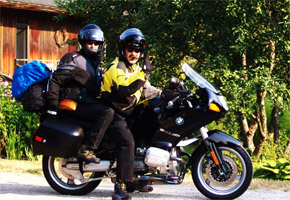 A commemorative trip to Nova Scotia on the latest family Beemer (a '99 R1100RS for you biker types) with just what we could fit in the saddlebags and a couple of small packs. Despite my protests, I realized I had no choice - I was the designated driver. The first day was a stretch day to get as much flatland behind us as possible. The 500 plus miles from Ann Arbor, Michigan got us to Elmira, NY. and nearly paralyzed us with NB syndrome (Numbus Buttockus). Another 350 miles the second day put as at the restful Grundberg Haus B&B in Waterbury, Vermont where we stayed for two days in the heart of the Green Mountains. 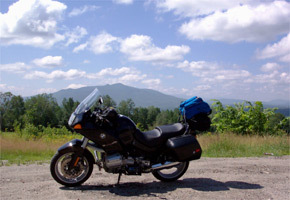 20 miles up the road from our B&B is Smugglers Notch, the pass between Mount Mansfield and Sterling Peak. 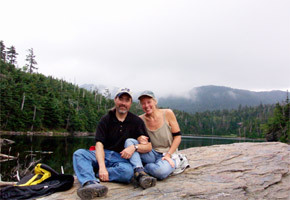 Atop Sterling sits this glacially scoured pond by the same name. We thought we had set out on a level trail. The thousand foot climb should have tripped a few switches (duh). Turns out there is a Sterling Trail (dead flat) and a Sterling Pond Trail (not flat). Fortunately, a pint of Shed Mountain Ale awaited at "The Shed" in Stowe. Did I say 'a' pint? Who counts on vacation? I think this is the only picture stop we made in New Hampshire coming or going. The roads were so much fun and it was always in the middle of a travel day for us, so we pretty much made a graceful, swift arc through the White Mountains and its fabulous roads. 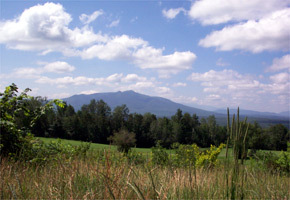 That would be Mt. Deception in the distance.